As the weather heats up around Arizona, a burning question looms in the minds of all pet owners. Where can we take our fur friends when the sidewalk is not suitable for paws? Local First Arizona is on the case with a handy directory of all local pet-related businesses in our state. Local First Arizona is a driving force behind building better communities for Flagstaff, Phoenix, Tucson and everything in between. So what could be better than spending some quality time with your four-legged best friend, while supporting the businesses that grow the local economy? Possibly doing the aforementioned activities with coffee, in which case, #2 has us covered. Today, we’re counting down the top five local spots to take your pets when the hot weather just won’t quit. Spoiler alert, we’re a little biased on #1. One of the hippest and highest quality spots for your pet, Noble Beast is an awesome local business in the Valley of the Sun! Stop in to pick up supplies for dogs, cats – and even hens – right in the heart of Central Phoenix. Check out the free pet nutrition consultation and fun events. Noble Beast is a locally owned & operated shop focused on customer service and keeping healthy pet food affordable. We love the snappy name and the handy location of Smelly Dog! Pop in for a dog wash, grooming or even pet daycare at this local Central Phoenix boutique. Get out of the heat and pamper your pet with lavish attention and quality products! Specializing in all natural, human-grade quality, gourmet dog treats using only the finest ingredients, Bentley’s Biscuits is where it’s at. Bring your fur friends in for healthy treats that are all-natural. A great excuse for your pets to learn new tricks! Dogs & Coffee Photography creates a unique experience for pets and owners alike! Spend the day striking poses and sipping java with your four legged best friend. Create happy memories and take home adorable photos! If you prefer to stay in during the summer months, Dogs & Coffee makes house calls. They will even bring the coffee! You saw this coming right? 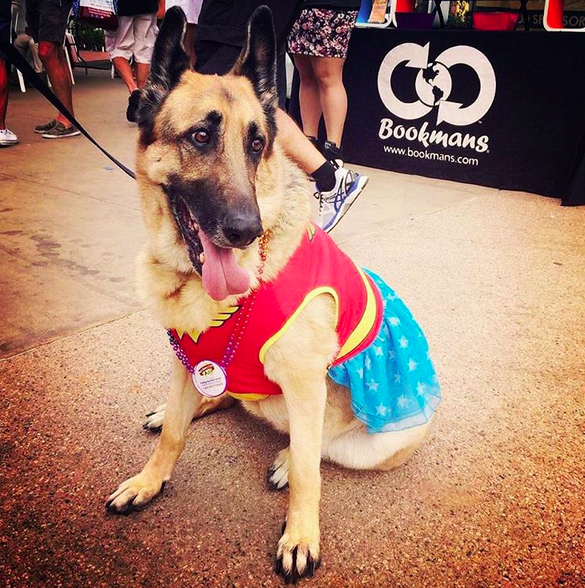 One of Bookmans’ core values is Animal Welfare, so in addition to loving pets of all kinds, we support local rescues and animal adoption organizations. Even better, you can always bring your own pet on a leash into all Bookmans locations! So when it’s over 100 degrees and you’re considering becoming a nocturnal creature, come peruse the orange shelves with your favorite pet in tow. In addition to our trove of collectibles, books, & media, we keep treats up at the trade counter so you’re both sure to go home with something delightful. We hope to see you this summer at Bookmans! Bring your best friends and enjoy the free events that we offer at each location. For all the details, check out our Events Calendar. Happy summertime to you and your pets!